Denture Adhesives Without Zinc; What Are The Options? Basically you have your choice of most name brand denture adhesives on the market. Creams, powders and wafers all have no zinc options. There is one glaring problem though, as denture wearers know, none of them really work. We’d like to suggest a more modern solution; adding Stabil-Dent Lower Denture Stabilizers. Lets first look at the zinc problem for a moment. There are a couple of issues here; one obviously being the zinc in denture adhesives but the other is a bit more subtle. Why are denture wearers using so much denture adhesive? We believe there are two answers; the high cost of new dentures and sadly the lack of skilled denture providers to provide proper clinical relines. The practice of denture making and relining is becoming a lost art. Sometimes dentures are even made overseas after impressions are taken. With a properly relined denture, the denture wearer is automatically exposed to less zinc because the bottom denture fits better. Along with a reline, Stabil-Dent is a great way to lessen your exposure to zinc as it reduces your need for adhesives or eliminate the need for them. We invite you to read about the benefits of Stabil-Dent. Due to recent studies large amounts of Zinc are no longer used in denture adhesives. 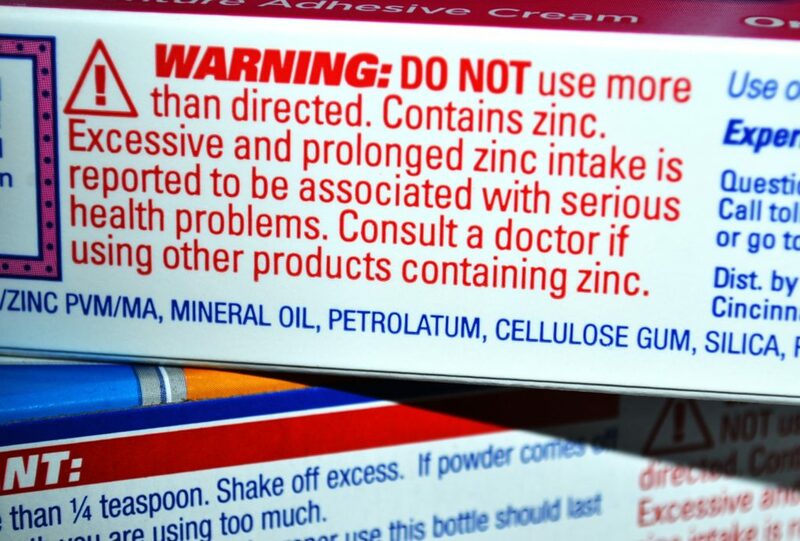 Tests were done from approximately 2008 – 2010 on patients in different studies and found that the main danger from zinc in denture adhesives was an imbalance in their copper levels. This condition lead to crippling disabilities and usually lead to numbness and tingling in their fingers and toes. This then progressed to Neuropathy. The one common factor that was discovered with all of the patients examined was the over-use of denture adhesives. This is a good read on the study. Too many people have become accustomed to using large amounts of denture adhesives, so they can avoid denture relines. This may be due to cost or lack of access to a clinical reline. Denture wearers need to realize dentures need to fit correctly without the necessity for denture adhesives to begin with and also need regular maintenance. With that in mind and the application of Stabil-Dent we think people would be much happier with their lower denture.